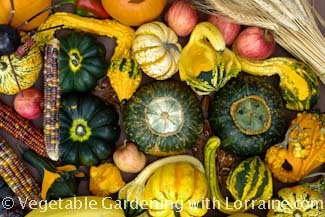 Beginning gardeners sometimes think that growing winter squash is a wintertime activity (and, it is if you live where it’s 80 degrees all winter!). Winter squash is so named because it’s a great storage vegetable, and has been used for thousands of years as a calorie and vitamin source to tide people over through the long winter months, until spring vegetables become available again. The early peoples of the American southwest relied on winter squash as one of their staple foods. They grew corn, beans and winter squash together in the same spot, a combination they reverently called “The Three Sisters”. The beans provided nitrogen for the corn, the corn provided the beans with a trellis to climb, and the winter squash provided a rain-retaining living mulch which shaded the soil from the parching effect of the desert sun. All three are wonderful storage crops. One of the hardest things about growing winter squash is choosing a variety! There are so many to choose from it can be a bit overwhelming. They fall into 4 main species, which branch out into hundreds of varieties that vary dramatically in shape, color, size, shelf life, sweetness, flavor and texture. My personal faves are Delicata and the big-old-ugly-delicious Hubbard. A good way to find your own favorites (before spending a summer growing them) is to visit farmer's markets in the fall and try different ones out. Browse the seed catalogs carefully, paying attention to the length of your growing season, and the flavor and texture descriptions in the catalogs. Johnny's has 64 pages of squash varieties online! Here is a Halloween winter squash sculpture I made with acorn, buttercup, carnival and spaghetti winter squashes, small and mini pumpkins, ornamental gourds, Indian corn, apples, wheat, and a spider (made out of a black plum, crabapples and twigs). Depending on which varieties you choose, and how deeply or shallowly you’ve loosened your soil, you will need to allow a 1½ - 3 foot diameter circle per plant for their root growth. They are heavy feeders and appreciate a deeply worked, very fertile soil with lots of organic matter. This is why people often plant squash in a tilled patch rather than a row. The patch is sometimes erroneously referred to as a “hill” (see side box). Also check out the double-dug raised bed article, which better explains why very deep soil prep is an advantage, especially if you're "breaking new ground". Above ground, winter squash are notorious wanderers, and they will sprawl all over the garden if you don’t train them where you want. The space requirement depends on whether you’re growing a bush or vining variety, but they will take a lot more space above ground than they do in their root zone. 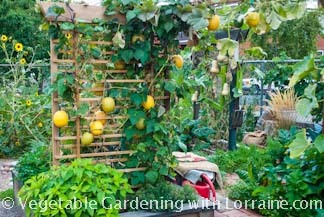 A well-built trellis is a beautiful and practical thing, especially in late fall when the squash plants have died back to reveal a hanging harvest of winter squash! 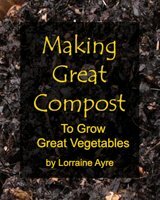 If you’re short on ground or are growing in raised beds, consider growing up! (Not that I’d know anything about that, at 58 I still wear purple Keen kid’s shoes). You can also plant winter squash near a chain-link fence, which makes a wonderful, sturdy trellis for small to medium-sized squash. (But don’t try to grow your 75-pound, state-fair pumpkins there… J). Growing winter squash requires very fertile soil, so prepare your soil as deeply as you can with a LOT of rich homemade compost. If leaves start to yellow later in the season, you can make your plants happy again by giving them a bit of higher-nitrogen organic fertilizer like fish emulsion or blood meal. Growing Winter Squash in "Hills"
Winter squash does not like wet feet, and needs well-drained soil. You’ll often read on a seed packet or on the web to plant beans, as well as squash and cucumbers “in hills, spaced x distance apart”. But unless you have a problem with soggy soil, it's not necessary. 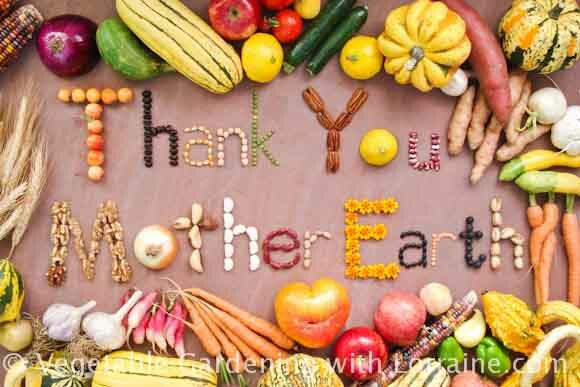 In Colorado this year, we are in a terrible drought, and yet I have seen many people in the community gardens growing beans and squash on elevated mounds, which are always dry and have nearly baked the poor plants to death. Most have yielded no beans at all. So if you are in a hot, dry climate it makes more sense to grow crops as the ancestral native Americans did in the southwest: in a trough, with ridges or “hills” channeling water down, so that any sparse rainfall from passing thunderstorms gets directed to the plant’s roots. But if you get tons of rainfall in your neck of the woods, growing winter squash on an elevated mound does make sense because the soil can drain and the roots won’t stay waterlogged. And since all squash is notoriously prone to powdery mildew, they do much better if watered from below with drip or leaky-pipe hose. They also benefit greatly by being sprayed once in awhile (when it’s cool!) with actively-aerated compost tea, which provides microorganisms that help defend again fungus. Despite its name, winter squash is not frost hardy, so for the earliest yields, I start my seeds in flats indoors about 2-3 weeks before the last frost date. I plant them about ½ to 1 inch deep (depending on variety – follow your seed packet), and make sure they stay warm, but don’t dry out. They do not like cold or even cool weather, so I usually wait to plant them out until a good week after last frost. I keep them covered with Reemay for the first week or so, just to baby them along a bit and help with the harshness of the transition from indoors to out. If you want to direct seed them in the garden, wait a little longer for the soil to warm up, maybe a week or so after your last frost date. I decide the exact spot where I want each plant (keeping in mind that the diameter of the rootball will be 1½ to 3 feet across, and also where my trellis is) and then I plant 2 or 3 seeds in one hole at each spot. This compensates for poor germination, but requires thinning down to only the strongest seedling after they’re up. As mentioned above, the most common problem in squashes of all kinds is powdery mildew. But squash family plants are also susceptible to squash bugs (left), squash vine borers (center) and striped cucumber beetles (right, but they come in many variations). The best control is prevention, which means growing your squash under Reemay to keep the bugs out… not very practical if you’re growing winter squash up a trellis. Reemay also doesn’t make for the most, err….photogenic backyard vegetable garden, either, but honestly, it’s the only thing that’s reasonably effective against all kinds of squash bugs. And once you see them, it's too late for Reemay. Once you notice the first squash bug, you’re in for a summer’s battle. They are hard to control organically (even chemical gardeners don’t have much success against them.) The best you can do is find ‘em, squash em, and squash their eggs. Don’t compost the spent plants at the end of the year, and use Reemay if you can the following year. Not very optimistic, I know. I wonder if backyard chickens or ducks would help? Make sure your winter squash are fully mature before harvesting them or they won’t keep. Hard-rind varieties like acorn, butternut, and Hubbard form a really tough skin when they’re fully ripe – you can’t scratch into them with your fingernail. With other types, they're usually ripe when they start to get kinda waxy on the outside. When vines die at the end of the season - because the powdery mildew finally caught up with them, or the drought, or eventually (sigh)… the first frost - don’t assume everything left hanging on the vines is ripe. Again, use the unripe ones first (or compost them if you don't like the taste), as they won't keep. Be sure to check out our winter squash recipes page. Leave about an inch of stem on the squashes when you cut them off. In my experience they store longer if you don’t wash them, but if you feel you must, use chlorinated water, and make sure they are bone dry before putting them on a shelf in the basement or garage – someplace where it stays cool but not cold (50-55 degrees F is ideal).